I will admit to having a challenge with this novel. I liked Linda Grant’s last novel (The Clothes On Their Backs) so much that it was my favorite for the 2008 Man Booker. I have great admiration for her journalism which, in her fiction, is complemented by a deep appreciation for her Jewish heritage. She is of my generation and experience so, when I read the opening promotions of this novel, I was eagerly awaiting it. All of that would represent the classic definition of “high expectations”. 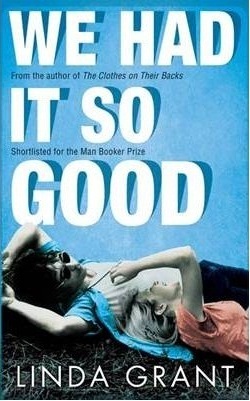 We Had It So Good is the latest example in what I think will be a genre that we will see more of in the next few years: mature writers who look back at the last half of this century when they started writing and the start of this one, when they are at their peak. Some, like Martin Amis in Pregnant Widow and Ian McEwan in Solar will choose to explore it from a highly personal perspective. Others, such as Jonathan Franzen in Feedom or even Jennifer Egan in A Visit from the Goon Squad will take a broader perspective. Grant clearly belongs in that latter category, but she brings a highly personal perspective that demands respect. Stephen could not get out of his mind how lucky they had been: himself, Andrea, Ivan and all their other friends. The sun had risen on them and had stayed all this time on their faces. Their purpose was to fulfil the ultimate destiny of the human race. He was fifty-five years old and for the first time he understood that nothing bad had ever happened to him. He lived in a house worth a fortune with his wife of thirty years. His children’s lives had worked out, no-one was on drugs or in prison, no-one had died of Aids. Everyone he knew led a nice life and on and on it was all supposed to go. That dream of the American melting pot will melt of its own accord. Stephen is, luckily, brilliant and wins a Rhodes scholarship, just as the Vietnam draft begins to send his generation off to their deaths. An “uncle” ( a real one, but, even more important, one with union connections) has got him into the seamen’s union (you have to be of the generation to know that this was the most mobbed-up of all the unions, teamsters and Jimmy Hoffa a distant second). While Oxford sends him a ticket, Stephen’s father cashes it in and the scholar ships to England on the SS United States as a working cabin boy and meets, from above decks, Bill Clinton, another Rhodes scholar, also on his way to Oxford. Okay, Grant is stretching credibility here (and that will continue) but she does it with a tongue-in-cheek smartness that is charming, not annoying. It is in Oxford that we are introduced to the conflicts that will define the generation. Academically brilliant, but socially inept, Stephen is in “college” when peering out the window he spies the “girls” next door (we are about two months from “girls” being a totally sexist description). They are academic “hippies” in outrageous costume (but they have wonderful breasts) and, less than 24 hours later, he and Andrea are lovers. They will be together for the rest of their lives — for those youngsters reading this, yes, stuff like this did happen, but not often. That too is not a spoiler (you really do want to read how it happened) but from then on this is a novel about how the children who were born in the five years after WWII cope with both coming of age and adapting (or not) to that maturity. Andrea comes from true British stock, Stephen from its American mirror — this is a novel about how those two contradictions come to resolution, or the lack thereof. I won’t give away too many details but Grant’s interest is in how — and why — all that potential for change in the 1960s never came to pass, at least for this group and, arguably, an entire generation. Stephen and Andrea marry, they have kids and their life settles into a routine. Ever present is the feeling that however much success in the present might look like, so much potential has been overlooked. Or maybe — and for me this is the most powerful theme of the novel — only so much potential existed. This is a theme that is starting to show up a lot in fiction and I do expect to see more — on the personal side, Amis and McEwan; on the more global aspect authors such as Franzen. For those of us who grew up in the generation (Stephen and I are virtually contemporaries) it offers much fodder for thought. For those readers who are younger, don’t dismiss it — this is the life that your parents lived. I don’t think that Grant completely succeeds. She opens up so many stories in the past of both Stephen and Andrea (and I have included no spoilers here) that the end of the novel becomes too much tidying-up and not enough showing potential. This is a portrayal of ordindary lives, lived in an extraordinary age — alas, for me at least, the ordinary took precedence over the extraordinary. Don’t let that dissuade you from reading the book — and I will say that this review is merely a gloss over some very intriguing plot and story lines that are included in it, many of which are worthy of a book themselves and have not even been mentioned here. I should acknowledge that my impression of Grant’s last novel has increased as time progressed; I can’t help but think that a year or two from now this one, also, will have risen in my evaluation. It has those kind of seeds.